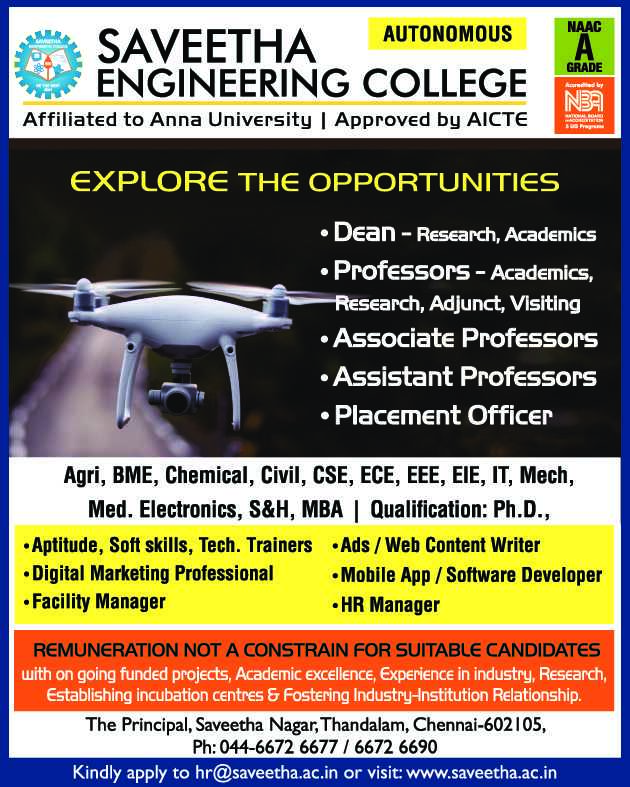 Saveetha Engineering College Chennai has advertised for recruitment of Professor / Associate Professor / Assistant Professor / Dean Plus Non-Faculty jobs vacancies. Interested and eligible job aspirants are requested to apply immediately from 10th April 2019. Check out further more details below. About College : Saveetha Engineering College, was started in the year 2001 by the Saveetha Medical & Educational Trust, is committed to develop this college into a renowned institution for Engineering education and research. The Saveetha Group of Institution is headed by Dr. N. M.Veeraiyan, a committed and dedicated Medical Professional. Our Institution ranked No.3 rd in Chennai by MHRD – National Institutional Ranking Framework. Only Ph.D candidates are required. How to Apply: Interested and eligible candidates are requested to send CV along with all copies of certificates / testimonials and recent PP size photos to the email address and postal address provided here (Kindly save the resume in your name and send in .DOC or .PDF format). Please mention the your department in the subject line of email.